For these thematic reasons, I wanted to investigate this particular story. Because of my role as the KCAC print publications coordinator, however, I also wanted to find out if journalistic approaches to writing might be a fruitful way for our students to research and recover past community history and also to promote future community formation.� In pursuit of this objective, I suggested the story assignment to my newspaper editorial board, and my assignments editor gave the story to Bennett. The story required Bennett to do some real research.� All I gave him was the idea.� I had no contact information.� Even an e-mail list-serv plea produced no help from my KCAC colleagues.� Ultimately, by the deadline for our second issue, Bennett had done all the recovery himself, first by calling the Cobb County commissioner�s office and then by contacting Mr. Joe Gavalis, the community activist who was instrumental in erecting road signs that marked the boundaries of the Chattahoochee Plantation community. Bennett also discovered that the present rekindling of Chattahoochee Plantation is more motivated by real estate value than by any genuine sense of community. Still, it�s very interesting to me that residents in that area feel that identifying with Cherokee and antebellum heritages increases the material value of their community.� Bennett�s final quotation of Mr. Gavalis � well placed at the conclusion of the story � suggests that home values will increase by 10 percent as a result of the name identification and other planned improvements to the subdivision. Bennett�s story, �Chattahoochee Plantation Attempts a Community Feel; Homeowners are Delighted,� appeared in the Oct. 20, 2000 issue of The Catalyst, Wheeler�s student newspaper. What do those green signs mean?� Found in eastern Cobb County, along Paper Mill Road, the Chattahoochee River, Powers Road and Johnson Ferry and mostly centered around Atlanta Country Club, the green �Former City Limits- Chattahoochee Plantation (1961-1995)� signs have baffled and intrigued many drivers for the past few months. 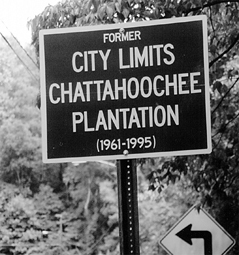 The area began to grow, and in 1961, House Bill Number 631 incorporated the city of Chattahoochee Plantation, GA,� complete with a mayor, Richard Simms, Jr., and a five-man council.� In 1968, Cobb County State House representatives added a 10-foot strip to Chattahoochee Plantation to stop the city of Atlanta from annexing Marietta.� They were taking advantage of a state law that no city could cross another city in an annexation move.� So this �new city� of Chattahoochee Plantation is not a new notion at all--it has been around for 39 years.� Since then, the community of Chattahoochee Plantation has grown together as a close-knit city that does not act like a city.� They do not have a mayor or government, but rather a group of residents, the Community Association, that meets to come up with regulations in the best interest of the homeowners. Recently, Gavalis was instrumental in putting up the green city limit signs.� �By putting signs up, we have rejuvenated a little history and a community feel.� We feel there is a lot of uniqueness to this community. We are trying to combine a village feel with lots of green space,� Mr. Gavalis said. ► Golder�s article was an assigned school newspaper project, but the results of similar research assigned to an entire class could be published on a web page and thus made available for all Internet users, or even submitted to a local or community newspaper for publication. ► This assignment can reach beyond the bounds of existing community to inform those outside of it of its historical significance.